The Week in iOS Accessories: Make a little music! The Consumer Electronics Show is underway in Las Vegas, which means a weeklong deluge of new gadgets and gear. We've been covering many new products individually, but here are a number of other iOS accessories that are worth a look. Griffin Technology: Griffin is showing off two new products geared towards music makers. The $80 MIDIConnect lets you hook up your MIDI-capable instruments and controllers with Garageband or any other compatible iOS app; it will be available this spring. The $150 StudioConnect is an iPad stand that includes both audio-in and -out ports; it goes on sale in February. 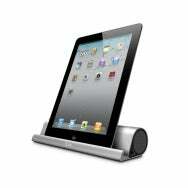 iDevices: Wish you had access to your iPhone's music library while in the shower? The $100 iShower makes that possible. This Bluetooth-enabled shower speaker has a 200-foot range and can provide up to 15 hours of use on three AA batteries. It also features a digital clock to ensure you don't get too caught up singing along with your music and forget to go to work. The iShower will be available for sale in March. 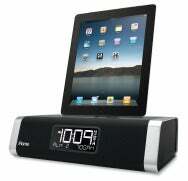 iHome: iHome unveiled three new alarm-clock docking systems this week. The $270 iW4 AirPlay system can be used with your iPhone or iPad, or you can take advantage of AirPlay support to wirelessly stream music from your iOS device or Mac to the iW4's 20-watt speakers. The $70 iP18 LED Color Changing Dual Alarm Clock Speaker System can be used with your iPhone or iPod touch; it's available in brightly colored cubes somewhat reminiscent of the old G3 iMacs. The $170 iD50 App-Enhanced Bluetooth Alarm Clock Radio Speakerphone can also be used with your phone or tablet, and it includes an AM/FM radio. These new products will be available later this year. IK Multimedia: IK Multimedia has two new products for musicians to sing about. 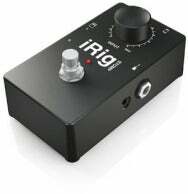 The $60 iRig Stomp is a guitar stompbox compatible with any iOS device; it can be used in conjunction with the $20 Amplitube app to add sound effects and volume. It will be available in the spring. The $40 iRig Mic Cast is a plug-in mic for your iPhone or iPad that includes a headphone output so you can monitor your recordings. The mic will hit the market during the first quarter of this year. iLuv: iLuv's $90 Mo'Beats system is a slim tablet stand with speakers included in the cradle, and it may be one of the most portable portable-speaker systems we've seen. You can stream music via Bluetooth or through the stand's aux-in jack, and the Mo'Beats includes a rechargeable lithium-ion battery for extended play. Mo'Beats will be available for sale in May. Joy Factory: Among the Apple-centric items that accessory manufacturer Joy Factory unveiled at CES are the $50 Zip Mini Touch-n-go Multi-Charging Station, a hub that includes a micro-USB port and a 30-pin dock connector for powering multiple devices at once; the $90 MagConnect Mounting Solutions kit that displays your iPad on a bendable carbon arm; the $100 Paladin Waterproof & Rugged Case for iPad 2, which is pretty much what it sounds like; and the $25 e-Glove, which keeps your hands warm while still letting you operate Apple's Multi-Touch devices. Just Mobile: Need to keep your phone or tablet charged in the car? Just Mobile has launched the $35 Highway in-car charger. It plugs into your vehicle's accessory outlet and features a USB port for connecting your devices. It also includes a fuse to prevent power surges that might short out your favorite iOS doodad. Unlike many CES launches, this charger is available for purchase now. Kensington: CES usually means a full range of new accessories from Kensington, and this year's show is no exception, as the company has announced a slew of new gear. 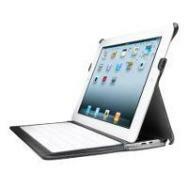 Among them are the $120 KeyLite Ultra Slim Touch Keyboard Folio for iPad 2, a thin keyboard case; the $20 Chaise Universal Tablet Stand; the $25 Virtuoso Twist Stylus and Pen, designed for jotting down notes either on paper or your iOS device's touchscreen; and the $15 Virtuoso Mini Collapsible Stylus. Klipsch: Three new AirPlay-compatible Klipsch speaker systems made their debut at CES. The company introduced the RoomGroove Air, which features dual 1-inch tweeters and 2.5-inch woofers; the Stadium, which includes horn-loaded tweeters, a three-inch midrange woofer, and dual 5.25-inch, built-in subwoofers; and the Console, which features 10-inch woofers and 12-inch subwoofers. The RoomGroove Air and Stadium speakers will be available this fall, with the Console following next winter. Velocomp: Athletes will want to take a gander at the $270 iBike Powerhouse, which attaches your iPhone or iPod touch to your bicycle handlebars and—with the aid of the iBike app and a wireless speed sensor—helps you set fitness goals and measures your progress in doing so. Users can also listen to music or make phone calls while riding. Velocomp did not say when the system will be available for purchase. Withings: Withings expands the use of iOS in the medical field with its new Smart Baby Scale. Stick your small child on the scale, and it wirelessly conveys the vital statistics to an iPhone running the free WiScale app. The scale is powered by four AAA batteries, and it should hit the market this spring. XtremeMac: The Soma BT Wireless Bluetooth Speaker includes a rechargeable battery that offers up to six hours of wireless music playback from your iPhone or iPad. It also includes a microphone for making speakerphone calls, and there's a line-in jack in case you want to use a non-Bluetooth MP3 player with the system. No pricing information is yet available; XtremeMac says the speaker will hit the market this spring.